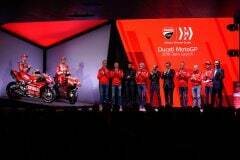 Ducati Motor Holding CEO Claudio Domenicali: "We want to make another, decisive step forward. I believe our know-how and the spirit that characterizes the people of Ducati Corse are an extra value"
Ducati Corse General Manager Luigi Dall’Igna: "We work hard to bring new ideas and evolutions to cover all the possible areas. With Andrea and Danilo, we\'re confident we have the right team to optimize the development"
\r\nNeuchâtel (Switzerland), January 18, 2019: The Mission Winnow Ducati team, which will compete in the 2019 MotoGP World Championship, was presented today at the iconic Cube, Philip Morris International\'s Research and Development centre in the lakeside Swiss town. 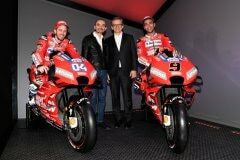 Riders Andrea Dovizioso and Danilo Petrucci unveiled the brand-new Desmosedici GP19 machine - in its captivating red livery - in front of an audience of international media, guests, sponsors and partners. Everything is now ready for an exciting new season, with the first of 19 races scheduled for March 10 in Qatar. 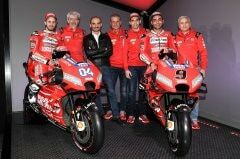 In two weeks\' time, Dovizioso and Petrucci will resume testing action with the Desmosedici GP19 at Sepang (Malaysia). \r\nClaudio Domenicali, Ducati Motor Holding CEO, added: "Racing has always been part of Ducati\'s DNA. The solutions and expertise gathered on track represent an asset that is directly tied to our product line, and the MotoGP project is crucial for us to produce models that are more performing, exciting and safe to ride for all our passionate fans. Looking back at the results achieved in 2018 on track, we can be proud because our Desmosedici GP proved to be one of the most competitive bikes, but we cannot settle and we want to make another, decisive step forward. I believe our know-how and the spirit that characterizes the people of Ducati Corse are an extra value compared with our rivals. I want to take this occasion to thank all the partners that are supporting us in this new challenge in MotoGP – including Audi Sport, which starting from this season will be main sponsor – and to send my best wishes to the whole Mission Winnow Ducati team for an unforgettable season." \r\nLuigi Dall’Igna, Ducati Corse General Manager: "2018 was another important season for us in MotoGP, one that saw us grow and improve again – both from a technical and a sporting point of view – for the fourth consecutive season. We were very competitive even on tracks that have traditionally been more difficult for us, and we achieved more victories and podiums overall compared with 2017. However, our direct competitors have also improved. We must do better and improve more than what we have done in recent years, bringing new ideas and evolutions to cover all the possible areas. With Andrea and Danilo, we\'re confident we have the right team to optimize the resources for the development of the bike. Our goals must be ambitious, as always, and we want to bring the MotoGP title back to Borgo Panigale." \r\nAndrea Dovizioso (#04, Mission Winnow Ducati): "2018 was a very positive year for me. We started with a victory and, even if we had some ups and downs, the difficulties pushed us to look in new directions and half-way through the season we made a big step forward. I\'m very happy with the work done with the team, we fought for the win basically throughout the second half of the championship and I think we\'ll make more improvements in the next tests to begin the season in the best possible way. The expectations are high, I have a great feeling with both the bike and my crew, and we can count on more experience. I\'m happy to have Danilo alongside me in the garage, we know each other well and I believe we can fight on track but also work together to develop the package." \r\nDanilo Petrucci (#9, Mission Winnow Ducati): "Last season was very important for me, my best ever in terms of points scored. Even if I barely missed my goal to finish first among independent riders, I still finished 2018 on an undoubtedly positive note. Racing with the factory colours makes me really proud and I can\'t wait to get started: I have a great feeling with my new crew, and the technical level is higher than ever. As for me, I know where I can still improve and I changed my conditioning program to make sure I\'ll be in my best shape ever come the first race. I\'m very happy to pair with Andrea: not only is he a phenomenal rider, but also a wonderful person. We\'ve known each other for a long time, and we started to train together with one goal: to both have a really strong season." \r\nThe Mission Winnow Ducati team will soon leave for Malaysia where, on February 6-9 at Sepang, the first collective pre-season tests will unfold. \r\n	If you experience any problems or have suggestions on improvements whilst visiting our website, please contact the Webteam by Personal Message or by emailing us. Ducati Corse General Manager Luigi Dall’Igna: "We work hard to bring new ideas and evolutions to cover all the possible areas. With Andrea and Danilo, we're confident we have the right team to optimize the development"
Neuchâtel (Switzerland), January 18, 2019: The Mission Winnow Ducati team, which will compete in the 2019 MotoGP World Championship, was presented today at the iconic Cube, Philip Morris International's Research and Development centre in the lakeside Swiss town. 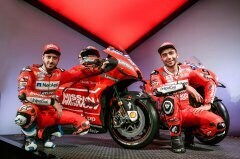 Riders Andrea Dovizioso and Danilo Petrucci unveiled the brand-new Desmosedici GP19 machine - in its captivating red livery - in front of an audience of international media, guests, sponsors and partners. Everything is now ready for an exciting new season, with the first of 19 races scheduled for March 10 in Qatar. In two weeks' time, Dovizioso and Petrucci will resume testing action with the Desmosedici GP19 at Sepang (Malaysia). 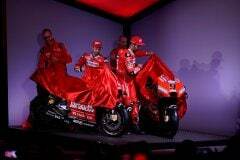 Claudio Domenicali, Ducati Motor Holding CEO, added: "Racing has always been part of Ducati's DNA. The solutions and expertise gathered on track represent an asset that is directly tied to our product line, and the MotoGP project is crucial for us to produce models that are more performing, exciting and safe to ride for all our passionate fans. Looking back at the results achieved in 2018 on track, we can be proud because our Desmosedici GP proved to be one of the most competitive bikes, but we cannot settle and we want to make another, decisive step forward. I believe our know-how and the spirit that characterizes the people of Ducati Corse are an extra value compared with our rivals. I want to take this occasion to thank all the partners that are supporting us in this new challenge in MotoGP – including Audi Sport, which starting from this season will be main sponsor – and to send my best wishes to the whole Mission Winnow Ducati team for an unforgettable season." Luigi Dall’Igna, Ducati Corse General Manager: "2018 was another important season for us in MotoGP, one that saw us grow and improve again – both from a technical and a sporting point of view – for the fourth consecutive season. We were very competitive even on tracks that have traditionally been more difficult for us, and we achieved more victories and podiums overall compared with 2017. However, our direct competitors have also improved. We must do better and improve more than what we have done in recent years, bringing new ideas and evolutions to cover all the possible areas. With Andrea and Danilo, we're confident we have the right team to optimize the resources for the development of the bike. Our goals must be ambitious, as always, and we want to bring the MotoGP title back to Borgo Panigale." Andrea Dovizioso (#04, Mission Winnow Ducati): "2018 was a very positive year for me. We started with a victory and, even if we had some ups and downs, the difficulties pushed us to look in new directions and half-way through the season we made a big step forward. I'm very happy with the work done with the team, we fought for the win basically throughout the second half of the championship and I think we'll make more improvements in the next tests to begin the season in the best possible way. The expectations are high, I have a great feeling with both the bike and my crew, and we can count on more experience. I'm happy to have Danilo alongside me in the garage, we know each other well and I believe we can fight on track but also work together to develop the package." Danilo Petrucci (#9, Mission Winnow Ducati): "Last season was very important for me, my best ever in terms of points scored. Even if I barely missed my goal to finish first among independent riders, I still finished 2018 on an undoubtedly positive note. Racing with the factory colours makes me really proud and I can't wait to get started: I have a great feeling with my new crew, and the technical level is higher than ever. As for me, I know where I can still improve and I changed my conditioning program to make sure I'll be in my best shape ever come the first race. I'm very happy to pair with Andrea: not only is he a phenomenal rider, but also a wonderful person. We've known each other for a long time, and we started to train together with one goal: to both have a really strong season." The Mission Winnow Ducati team will soon leave for Malaysia where, on February 6-9 at Sepang, the first collective pre-season tests will unfold. Powered by vBulletin 3.5.4 - Copyright © 2000 - 2019, Jelsoft Enterprises Ltd. - © Ducati Sporting Club - All times are GMT +1. The time now is 03:17 AM.